The Habitat III preparatory process started in September 2014 and will continue until the third session of the Preparatory Committee for the Habitat III Conference in Surabaya, Indonesia, in July 2016. During this period, 11 regional and thematic meetings have been held all over the world, mobilizing national and local governments and stakeholders. The Habitat III policy units, that have since submitted their recommendations, were an exercise built on the work of the UN Task Team on Habitat III and the elaboration of the Issue Papers. 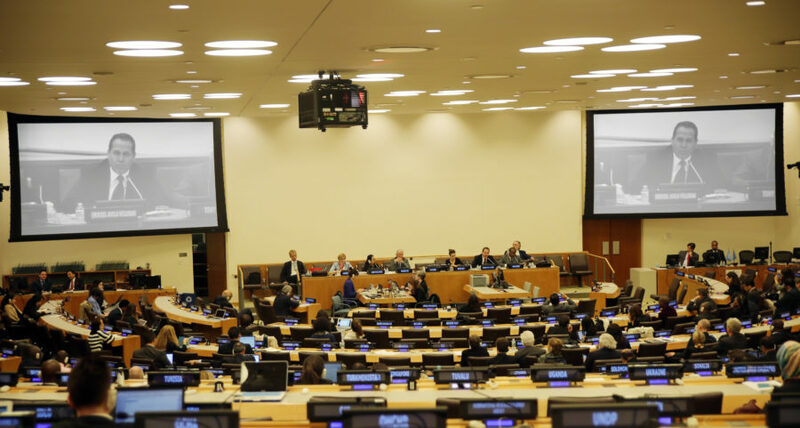 A crucial next step in the preparatory process, the Open-ended Informal Consultative Meetings, held 25–29 April 2016 at the UN Headquarters, offered an opportunity for member states and stakeholders to offer feedback on the conclusions of the Policy Units and the regional and thematic meetings. In his opening statement on the first day of the meetings, Habitat III Secretary-General Joan Clos expressed sympathy and support for Ecuador in light of the earthquake that struck the country mid April, and commended the government for its steadfast commitment to host the Habitat III Conference despite the tragedy. He underscored Habitat II as a major endeavour in engaging stakeholders in the process, and Habitat III as an initiative that further deepens and advances the level of stakeholder participation achieved in Habitat II, stressing the importance of collaborative input into the zero draft document that will be released later this week. Following the opening, a synopsis of key recommendations from the policy unit experts was presented, followed by a general exchange of views. Also discussed were the linkages among the New Urban Agenda, the Sustainable Development Goals (SDGs), the Sendai Framework for Disaster Risk Reduction (DRR)—and the role of local and national governments in addressing the development challenges elaborated in their resulting outcomes. In the afternoon session, presentations were made on the outcomes of the Habitat III regional meetings (Asia-Pacific, in October 2015, in Jakarta, Indonesia; Africa, in February 2016, in Abuja, Nigera; Europe, in March 2016, in Prague, Czech Republic; and Latin America and the Carribean, in April 2016, in Toluca, Mexico). Eruviel Avila Villegas, Governor of the State of Mexico, stated that cities should be able to meet present needs without compromising the needs of their future generations, and stressed that the success of the New Urban Agenda would hinge on the commitment of people and governments to shape a new reality for cities of the world. Lana Winayanti, Senior Expert of Ministry of Public Works and Housing in Indonesia, emphasized that people needed to be seen as agents of change rather than solely as beneficiaries. She also emphasized the youth as key actors for the urban future. Karla Šlechtová, Minister of the Ministry of Regional Development in the Czech Republic, touched on priorities for cities: to be innovative, productive, green, compact, resilient, inclusive, safe, and marked with good governance. The morning sessions consisted of recommendations from Policy Unit 1, the panel on the Right to the City and Cities for All, followed by recommendations from the Policy Unit 2, the panel on Socio-cultural Urban Frameworks. Jose Carrera, Vice-president for Social Development of the Development Bank of Latin America itemized their strategic conclusions for the New Urban Agenda. The afternoon sessions commenced with recommendations from Policy Unit 10 on housing policies. The meeting and presentations focused on public spaces (from the Barcelona Thematic Meeting), informal settlements (from the Pretoria Thematic Meeting), and civic engagement (from the Tel Aviv Thematic Meeting). Alison Brown, Professor of Urban Planning and International Development, Cardiff University, differentiated “informal settlers” from “slums,” stating that informal settler refers to an absence of tenure rights, while those living in slum areas are those living in inadequate, poorly structured housing. Eytan Schwartz, CEO, Tel Aviv Global, former Senior Advisor to the Mayor, described civic engagement as a necessity in today’s world. The third day centered on the transformative commitments for a sustainable urban development that launched with the theme, “Sustainable and Inclusive Urban Growth, Prosperity and Opportunities For All”. Policy Unit 7, the panel on urban economic development strategies discussed on an implementation framework in relation to structures supporting economic development; impact of equality and poverty; the role of industry; and livelihood generation. Shipra Suri, Vice President, International Society of City and Regional Planners (ISOCARP), India brought attention to the current situation being a time not just of economic crisis, but a humanitarian crisis. Policy Unit 9, the panel on urban services and technologies, focused their recommendations based on the demand for urban infrastructure investment. Issues included sustainable consumption and production of water, energy and resources; focus on all levels of governance and importance of data in support of urban infrastructure and services. The second theme, “Ecological and Resilient Cities and Human Settlements” centered on institutional frameworks with the three pillars: institutional context, financial mechanisms, and, monitoring systems. Day four of the meetings continued at the UN Headquarters in New York. The meetings for the day focused on Effective Implementation with the first theme, “Establishing a Supportive National, Regional and Local Framework”. Throughout the day, the presentations consisted of the National Urban Policies by Policy Unit 3, Urban Governance, Capacity and Institutional Development by Policy Unit 4, Urban Spatial Strategies: Land Market and Segregation by Policy Unit 6, Metropolitan Areas. The panelists in the morning sessions addressed the issues on national urban policies. In particular, combining technical strength with political commitment and support from stakeholder, as well as citizen participation. Policy Unit 4, the panel on urban governance, capacity and institutional development discussed their recommendations for new urban governance. The panelists during the afternoon sessions continued the theme, “Strategic and Integrated Planning and Management of Urban Spatial Development” and addressed Urban Spatial Strategies: Land Market and Segregation. The discussions on Metropolitan Areas were taken from the outcomes of the October 2015 Thematic Meeting in Montreal, Canada. The Habitat III Open-Ended Informal Consultative Meetings culminated on Friday, April 29, where Enhancing Financing and Other Means of Implementation was the thematic focus in the morning. The first panel began with a presentation by Lourdes German, Director, International & Institute Wide Initiatives, Lincoln Institute of Land Policy on Municipal Finance and Local Fiscal Systems. Subsequently, the panel on Financing Urban Development discussed the outcomes of the March 2016 Thematic Meeting in Mexico City, Mexico. Raquel Cecilla Kismer de Olmos, Director of the Institute of Administration, Government and Economic at UNTREF, Argentina shares that a municipal finance systems’ design can have significant impact on the equity of the cities. Peter Tyler, Professor, Department of Land Economy in University of Cambridge, UK suggests that there is a lot to learn from looking at how cities can adjust to the changing financial circumstances. The afternoon session was devoted to the follow-up and review of the New Urban Agenda and outcomes of Habitat III preparatory process. Habitat III Secretary-General Joan Clos closed the sessions by stressing the importance of urbanization for sustainable development and reflecting on urbanization as an active, and not an incidental or passive, agent of development. Habitat III Bureau Co-chair Maryse Gautier thanked all of the participants of the consultative meetings and summarized the key messages from the week, which included the importance of having an adequate resource management system linked to what we want to preserve, the environment and resilient cities as key elements to the New Urban Agenda, and the need for urban finance to be further mobilized.